On the final day of the men’s championship a clean score was registered for the first time – team Russia, which had to aspire for maximum, whitewashed the Americans. But all their efforts were in vain, as the leaders, team China, had defeated Poland by a close score, so there was no need for tiebreakers. Their setback did not prevent Poland from winning bronze medals. Indians deprived Turkey of the fourth place. In the women’s tournament, Russia had applied the finishing touch victoriously and won gold medals of the World Team Championship for the first time. For their opponents, the loss had enormous consequences: China had predictably beaten Egypt and took second place on individual points, while Georgia and India caught up with Ukraine and surpassed it on the individual tiebreaks. Bronze went to Georgians. Team Ukraine that had come to Khanty-Mansiysk in a radically altered lineup, kept on fighting for highest place throughout the whole tournament, but was demoted to the fifth place in the end. Li Chao, who had handed a victory to his team in the pivotal match against Russia, became twice the hero of the championship. On the final day Polish players had quickly thrown away all ambitions while playing with White, and on the even-numbered boards Duda and Bartel employed the same variation of the Slav Defense, so until move 15 both games developed similarly. Then Ju Yangyi moved his rook to d1, and soon a level endgame arose in the game. As for Li Chao, he moved it to е1, supporting the е5-pawn and leaving the d1-square vacant for his queen-pawn. White managed to develop his initiative on the K-side, and Bartel’s completely turning to defense did not save him. 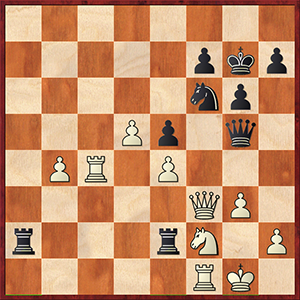 After the incorrect exchange of light-squared bishops, white knight lodged itself on е4 without hindrance and played a decisive part in the attack. 28.Qf4!. There is no adequate defense against the threat of Rf3 as 28…Rd3 results in a loss of an exchange followed by check on f6. 28…g5 29.Qg3 Rd1+ 30.Re1 Rd3 31.f3 f6 32.exf6 Bxf6 33.Bxg5 Bxg5 34.Nxg5 Qd4+ 35.Kh2 Qg7 36.Rc7 Rd7 37.Rxd7 Nxd7 38.Rxe6. 1-0. In the match Russia vs. USA, top-board players Nepomniachtchi and Shankland staged a high-voltage thriller in the sharp Caro-Kann variation. On the move 28 Black refused a continuation in which he would lose a piece but, according to analysis, obtain adequate counterchances. Ultimately, Shankland did agree to this balance of material, but his hopes for holding out in a passive endgame disposition were dashed. 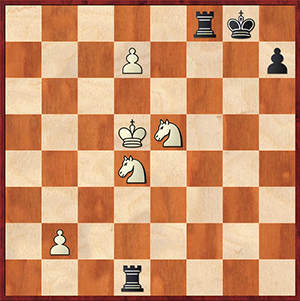 Matlakov played out an enterprising opening against Robson and, through a pawn sacrifice, developed strong initiative in the center where the enemy king was stuck. Premature regain of material led to simplifications and to the loss of a considerable share of the advantage, but on the move 36 Black had missed an opportunity to set a pawn barrier for the white king in the knight endgame This time the European champion was in no mood to forgive errors. On the even-numbered boards, the main part in the informative strategic play was given to open g-files. Having underestimated Fedoseev’s threats, Xiang left his king inadequately defended and shortly before the time control his position became hopeless. Onischuk, who was the one to have started active actions on the K-side, was outplayed by Vitiugov. Looking for an escape, the American grandmaster transposed into a sharp ending where two white knights fought against Black’s rook pair. Vitiugov traded one of those rooks for the enemy passed pawn, and the other one helped his own passed pawn to queen. 47.Nec6 h5 48.d8Q Rxd8+ 49.Nxd8 h4 50.N8c6 h3 51.Ne7+ Kf7 52.Nef5 Kg6 53.Ng3 Kg5 54.Ke4. In the line 54.Ne4+ Kf4 55.Nf2 h2 56.Nxd1 h1Q+, White is undone by his king’s position – the knight is lost because of check. 54…Kg4 55.Nde2 Re1 56.Ke3 Rxe2+! 0-1. The outcome of the close-fought match between Turkey and Belarus was decided on the second board. In spite of some inaccuracies, Kovalev had been putting pressure against Yilmaz’s position practically throughout the game and finally wore down his opponent’s resistance in the rook endgame, when on move 47 the latter failed to “guess” which of two white pawns, b2 or h3, should be eliminated. India defeated Norway by a confident score 3 to 1. After Salomon had presented Adhiban with a bishop pair and a weakness on е6, the latter’s aggressive play gained him both positional and material superiority. Elsness sacrificed an exchange to Karthikeyan but got no compensation at all for his troubles. Drawn games were not without their adventures. Sasikiran must have had some kind of a blackout in the pawn-up rook endgame against Hauge, when he went for an unfavorable exchange, thus losing his chances for a win. On the other hand, the fortune offered Vidit a slight compensation for the missed chances in his earlier game against Svidler. Tari, who was a piece up in a position with the enemy king in the center, overlooked the only move that allowed him both to parry mating threats and to retain material advantage. Ukraine overcame Egypt 2.5 to 1,5. Ameir had “forgotten” to trade off White’s dark-squared bishop, so Moiseenko dealt a simple blow that resulted in an immediate denouement. Kravtsiv outplayed Abdelnabbi in a closed-center structure. The star of the outsider team was Fawzy, who managed to exploit Areshchenko’s error: the latter had been too hasty with active actions in the center and found himself down a pawn. In the women’s main encounter Russia vs. Ukraine, Kosteniuk had sacrificed an exchange to Ushenina in the Sicilian middlegame, exposed her opponent’s king and gave perpetual check, thus clenching gold medals for her team. In the ending of an opening, Zhukova won a piece with her tactical blow and; Lagno had certain compensation for this loss by way of three pawns and exposed white king. In the following struggle White kept skillfully increasing her advantage, but just two moves before time control the Russian player made use of her opponent’s slipup and, in her turn, carried out a tactical trick with a temporary sacrifice of a second piece. After the time-trouble was over, on the board there was an ending in which black pawns were no weaker than White’s bishop. Girya played a strong game against Buksa. Olga kept hoarding diverse plusses, and when Black had obtained connected passed pawns on the K-side, resistance became pointless. Gunina gained an edge in the endgame after Gaponenko had weakened her kingside pawns. After turning her position into a won one, the Russian player granted her opponent a chance for an escape with a series of unlucky moves, but the Ukranian stumbled when a draw was just a short step away. In the game there followed 48…Kf8? 49.Bxd3! a2 50.e6 Ra3 (50…a1Q 51.e7+ Ke8 52.Bg6+ is impossible) 51.Kg4 Rxd3 52.Ra7, an in a few moves Black acknowledged defeat. After the correct move 48…Kd8, White is already unable to play 49.Bxd3 a2 50.e6? a1Q 51.e7+ Kd7, and on 49.e6 Black has 49…Nc5 (but not 49…a2? 50.Rd7+ and 51.Bxa2). Team China beat Egypt easily, although the embarrassment that has happened on the top board evokes inevitable associations with the notorious Chigorin’s blunder. Here the number-two-rated player of the world moved 39.Nh3?? and got mated after 39…Qe3+! 40.Qxe3 Rg2+ 41.Kh1 Rxh2+. The move 40.Rf2 does not help as well: 40…Re1+ 41.Kg2 Rxf2+ 42.Nxf2 (42.Qxf2 Re2) 42…Rg1+, winning the queen. In all the remaining matches, top board players of winning teams did not look too confident either. The Georgians were clearly better than the Americans on lower boards. 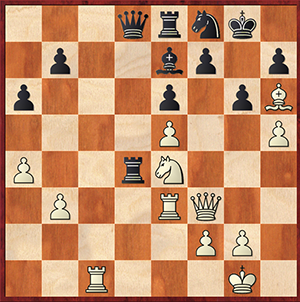 In the clash of leaders, all Foisor lacked in order to obtain an overwhelming advantage in complications against Dzagnidze, was just a couple of precise tactical solutions. Nemcova’s lack of patience prevented her from cashing in on her extra two pawns in her game against Khotenashvili, so the final result turned out to be 3:1. India defeated Azerbaijan by the same score. Quite appropriately, all the games in this match ended in victories for one of the parties: Mammadzada had beaten Tanya but got no support from her team. In Vietnam’s match against Poland, it was Pham who set an example for her teammates with her strong performance against Socko. 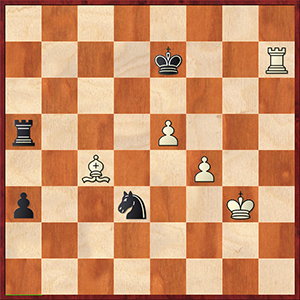 Vo successfully defended a French endgame against Zawadzka; at one moment she even had a chance to make her opponent regret her insufficiently thought-out exchange sacrifice. However, on lower boards Polish players never met with serious resistance.